I am a sculptor and woodcarver taking inspiration from the form of the log rather than forcing my ideas on squared timber. I allow the wood to tell me what to carve as I search for the story hidden in the wood. I prefer the human figure but my work includes a wide range of subjects. I specialise in corporate art and private commissions. You will find examples of my work divided into three sections on my gallery. Most of the work is not for sale as it was commissioned. I am happy to accept commissions for all types of work. I prefer to start from the natural form of the log, tree, or root, as these have natural curves and strengths that help to give life and movement to my figures. With square cut timber, these elements are not so evident, and the figure can easily look stiff like a wooden toy soldier. Carving is, in many respects, a “one chance” activity. If too much wood is taken off, the options for recovery are limited. The carver needs to plan carefully, and visualise the finished result while it is still in the block. He needs to have a good knowledge of the form, which I obtain by drawing the subject constantly. The human figure is the one subject that surrounds me at all times, and I always carry a sketchbook, and draw in all situations and at all opportunities; whilst waiting for and on all forms of transport, in a café and theatre, at meetings and anywhere I can find a free temporary model. These drawings provide a mental visual library of body shapes that I can fit into the wood. There are difficulties in using the human figure. The most important is that almost everyone can tell when you have got it wrong, although very few can say why or how to put it right. Pushing the figure/face to its ultimate limits helps to resolve the problem. For other subjects and clients commissions, the internet, books and the local museum provide the information. If possible I draw and take engineering type photographs – plan, front and side elevations, and perhaps make a plasticine model of the subject. For most of my life I have been a professional but part-time woodcarver and sculptor, earning my living as a civil servant and lately as a computer consultant. In 1995, I made a break and started on the road to taking a B.A. in Fine Art at the University of Central Lancashire, Preston. It was an exciting road, especially the six months I spent as an exchange student in Richmond, Virginia. There I met American carvers and joined in with their club activities. 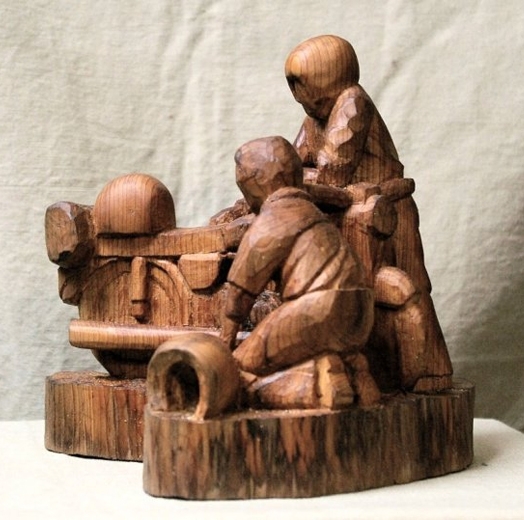 I am a member of the British Woodcarvers Association, and Lancashire and Cheshire Woodcarvers.